If you can’t sleep properly at night and get awake due to excessive numbness and tingling of the hand, often mistaken as wrist pain, you could be suffering from carpal tunnel syndrome. The term ‘Carpus’, originating from the Greek word “karpos” means “wrist.” There is a band of tissue around the wrist that provides support to the joint. There is a canal like structure between this fibrous band and the wrist bone which is known as the carpal tunnel. The median nerve passing through the carpal tunnel receives sensations from the thumb, index, and middle fingers of the hand. When there are such conditions that lead to swelling or changes in the tissue position, the median nerve is compressed due to decreasing size of the canal. 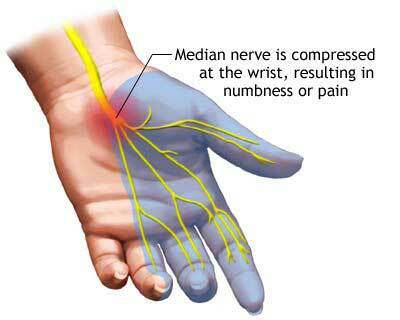 It affects the functioning of the median nerve that loses its capability of sensations. This causes tingling and numbness of the thumb, index, and the middle fingers which is known as “Carpal Tunnel Syndrome” or CTS. What are Carpal Tunnel Syndrome Causes? Most of the patients suffer from carpal tunnel syndrome due to idiopathic causes which means there is no specific cause for their carpel tunnel syndrome. However, there are also cases that have some specific causes that include genetic predisposition and certain diseases like rheumatoid arthritis, hypothyroidism, acromegaly (a disorder of growth hormones), diabetes mellitus, amyloidosis, sarcoidosis, multiple myeloma and leukemia. Certain other medical conditions like obesity, pregnancy and trauma are also the causes of carpal tunnel syndrome. Certain work related activities are also attributed as the cause of carpal tunnel syndrome in some people. However, these reasons have not been established medically and are in a state of controversy. As per the believers of work related causes for carpal tunnel syndrome, repetitive tasks, force, posture, and vibration such as those evident in cases of continuous typing on computer keyboard or on mobile phones and even while playing guitar can lead to carpal tunnel syndrome. Those suffering from carpal tunnel syndrome, feel numbness and paresthesia (a burning and tingling sensation) of the hand in the thumb, index, middle, and part of the fourth fingers. These sensations are more acute at night while asleep because most of the people tend to bend their wrists when they sleep, which further compresses the carpal tunnel. This makes one awake from sleep. These are the initial symptoms of carpal tunnel syndrome which, if left untreated, can lead to more pronounced burning sensation, cramping and weakness of the hand. In advanced stages of carpal tunnel syndrome, the grip of hand decreases and things fall from hands more often. Also, sharp pain in the forearm is felt. In chronic carpal tunnel syndrome, one can even experience wasting or atrophy of the muscles of hand, especially those which are close to the base of thumb in the palm of the hand. Is Wrist Pain Always a Case of Carpal Tunnel Syndrome? No, all the cases of wrist pain can not be called carpal tunnel syndrome. If there is a wrist pain at any location and with any kind of severity but lacks the sensation of numbness or paresthesia, it is not likely to be called a carpal tunnel syndrome. A medical examination of neck, shoulder, elbow, pulses, and reflexes are essential to exclude other conditions that are similar to carpal tunnel syndrome. To check carpal tunnel syndrome, sometimes the front part of the wrist is tapped that produces a tingling effect known as Tinel’s sign of carpal tunnel syndrome. To ensure whether any kind of wrist pain or discomforting condition of wrist is carpal tunnel syndrome or not, one should go for nerve conduction velocity test. This test measures the rate of speed of electrical impulses as they travel down a nerve. In carpal tunnel syndrome, these nerve impulses slow down as they cross the carpal tunnel. A test of muscles of the extremity, electromyogram (EMG), is sometimes suggested to exclude or detect other conditions that might be similar to carpal tunnel syndrome.